The Macanudo Cru Royale Robusto cigars are medium-bodied and full-flavored cigars, handcrafted under the personal direction of the legendary Benji Menendez. A true medium bodied Macanudo cigar, the Macanudo Cru Royale Robustos are handmade in the Dominican Republic under the direction of famed Benji Menendez. 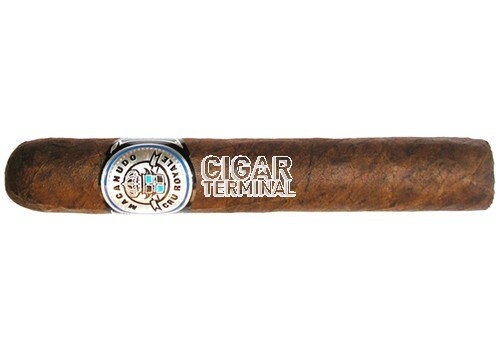 The Macanudo Cru Royale cigar has a long filler blend of Nicaraguan and Dominican Viso, Brazilian Mata Finas, and a proprietary Dominican La Vega Especiale binder, rolled with Ecuadorian Habano seed wrappers. The leaves combine to produce a cigar with a more defined identity and boldness than the classic Macanudo, but maintaining the core characteristics and profile loved by Macanudo smokers. Rich and complex.